World No. 1 has picked up the next big title - the only one missing from his collection - of World Chess Champion. 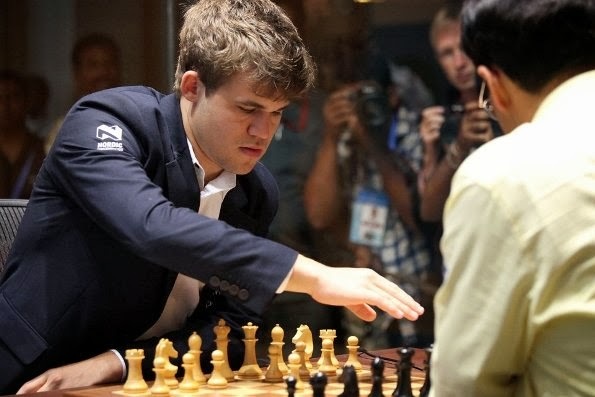 Magnus Carlsen of Norway became the World Chess Champion after drawing a fascinating endgame in Game 10 with defending champion Viswanathan Anand in Chennai today. The final score read 6,5-3,5 in favour of Magnus Carlsen. The match was sponsored by the Tamil Nadu state and organized by FIDE and AICF. The 10th game started with the Sicilian defence. Anand attempted a sharper line with black, possibly Naidorf, but Carlsen stirred the play into quiet waters with an early trade of the light-squared bishops. Please subscribe to Alexandra's mailing list... free! In the relatively stable pawn structure the players maneuvered the pieces until a careless queen move (28…Qg5) by Anand permitted a neat combination that would net a pawn for white. Carlsen continued correctly (29.e5), but then released the tension too quickly when 30.Nc3 would have piled the pressure. Anand was allowed to win the pawn back. After the massive exchanges on d6 a knight endgame appeared on the board. Expecting a draw offer, the press room was getting ready to meet the players. However, the fight continued beyond the first time control. New Queens appeared on the board, one for each player, but the equilibrium was not ruined. Draw signed on move 65. The winner would be the player earning 6.5 points which Magnus Carlsen duly accomplished. Congratulations to Magnus. Sorry for Anand though. But life has to go on. It had to be. Congrats Magnus. Reminds me of Chess Queen winning world championship in Kalmykhia. Congratulations to Norway fans. Anand of course remains Anand. Ultimately the match lived up to all the expectations. thrilling. Ultimately it was Anand's decision to play for a draw that proved his undoing I think. all credit to Magnus for surviving the psychological battle but it was downhill from Game 5.